A girl (3-year-old, 11 Kg) presented with poor effort tolerance, easy fatigability, and depressed left ventricular ejection fraction (LVEF) [9% by three-dimensional (3D) echocardiography]. The anomalous left coronary artery (LCA) was arising from the posterior facing sinus of pulmonary artery (ALCAPA). Collaterals feeding the LCA in the interventricular septum could not be appreciated on echocardiography. Basal and mid segments were severely hypokinetic. Apical segments were dyskinetic along with a positive strain and postsystolic shortening. 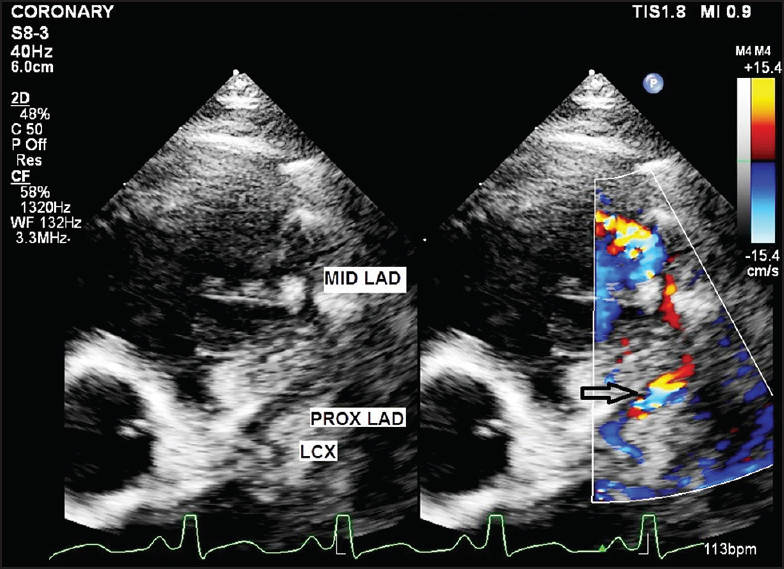 There was significant endomyocardial fibroelastosis and moderate mitral regurgitation. Preoperative pulse wave Doppler (PWD) findings are shown in [Figure 1]. The wall filter was set at low levels and Nyquist limits were, in addition, set as low as possible for optimal visualization in modified short axis view. In mid left anterior descending (LAD) artery, there was systolic and diastolic flow reversal with brief interruption by forward flow during the early part of diastole. The signal during mid and late diastole was very weak. Due to abnormal orientation, right coronary artery (RCA) flow could not be consistently captured. In view of very poor baseline left ventricular function, cardioplegia and aortic cross-clamp was avoided because of concerns of further insult to the already sick myocardium. She underwent left internal mammary artery (LIMA) to LAD (off pump) graft. Site of anastomosis between LIMA and LAD was fashioned close to left main coronary artery (LMCA) bifurcation so as to allow adequate circumflex perfusion. LMCA was ligated close to the pulmonary end. She had an uneventful postoperative recovery. Early postsurgical PWD findings in the LCA were as follows [Figure 2], [Figure 3], [Figure 4]: There was holodiastolic forward flow that had an early peak and decline. During systole there was flow reversal. The site of anastomosis was evident by flow turbulence noted in proximal LAD and a portion of LAD and left circumflex upstream to the anastomosis was having blue flow while mid/distal LAD was showing red flow (usual color conventions of color Doppler flow assessment). After 6 months, LVEF improved to 30% [Videos 1 and 2]. 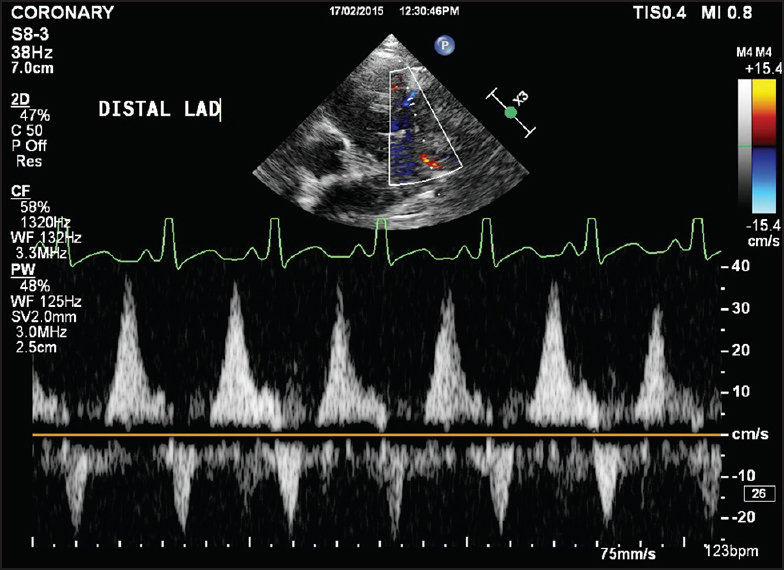 Basal segments had significant improvement in contractility. The entire apex remained dyskinetic. 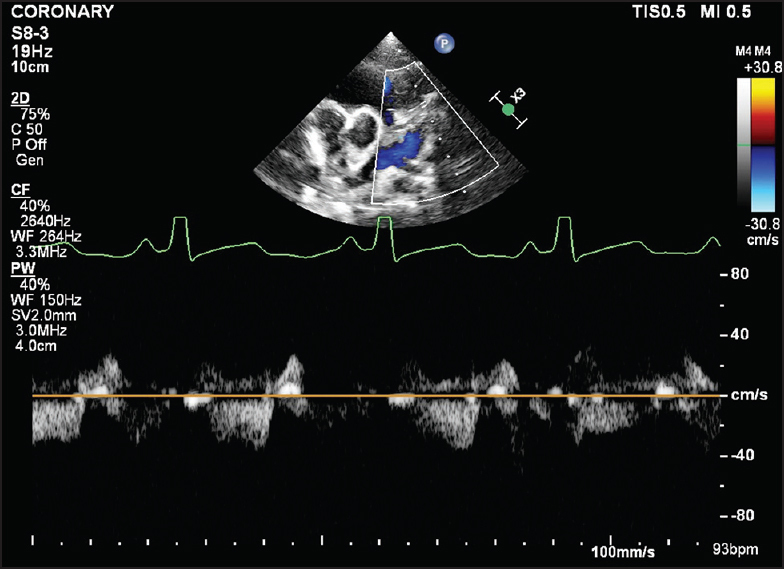 There was diastolic and systolic forward flow in mid LAD with the former being of a higher velocity [Figure 5]. McCrindle BW, Li JS, Minich LL, Colan SD, Atz AM, Takahashi M, et al. ; Pediatric Heart Network Investigators. Coronary artery involvement in children with Kawasaki disease: Risk factors from analysis of serial normalized measurements. Circulation 2007;116:174-9. Tian Z, Fang LG, Liu YT, Zhang SY. 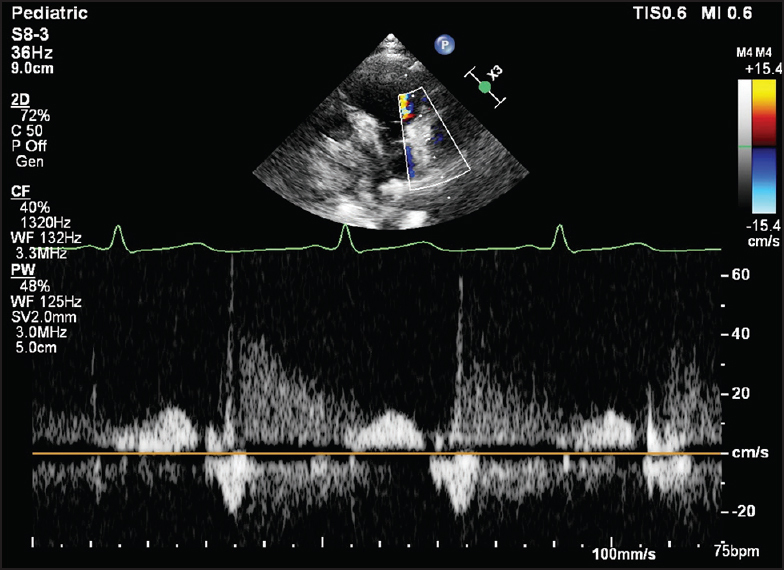 Anomalous origin of the left coronary artery from the pulmonary artery detected by echocardiography in an asymptomatic adult. Intern Med 2013;52:233-6. 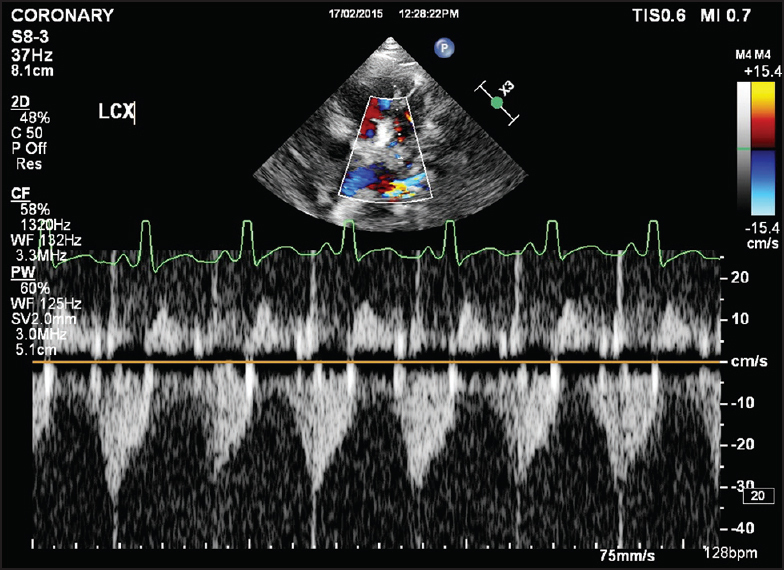 Drinkovic N, Margetic E, Smalcelj A, Brida V. Echocardiographic diagnosis of anomalous origin of the left coronary artery from the pulmonary artery. Eur J Echocardiogr 2008;9:309-10. Varghese M, Kothari S. The caveats in the diagnosis of anomalous origin of left coronary artery from pulmonary artery (ALCAPA). Images Paediatr Cardiol 2010;12:3-8.